"Cork City Ballet... frothing with charm and professionalism"
"Bodyguard, with jazz ballet choreography by former Irish National Ballet ballerina Patricia Crosbie... was a great crowd pleaser"
"Modern themes and references and music are all used with total confidence.... and further distinguished by excellent costuming, confirms Alan Foley as a significant force in dance in Ireland today"
"Monica Loughman positively sparkled in the Odalisque pas de trois from Le Corsaire"
"A breathtaking and memorable Giselle, and one of the best you are likely to see"
"Patricia Crosbie's short balletic poem Eva, to music by Van Morrison, gave a tantalising hint of what Ireland could contribute to ballet if it managed to harvest its immense musical talent"
"…Cork City Ballet offers a cocktail in which skill is blended with excitement…"
"Giselle was a company triumph"
"…The Black Swan Pas de Deux brought the house down…"
"Koulagina is such a pro that she could zap fouettes off on a sloping football pitch"
"Expertise is a good partner, but no substitute for sophistication.... Foley's vision, approach and style are utterly sophisticated"
"…Each performance is packed with vitality and passion…"
"Alan Foley's Salut d'Amour showed a talent for lyrical romantic choreography"
"Choreographer Jane Kellaghan deserves special applause for her excellent stage craft"
"Cork City Ballet is gradually and successfully re-establishing classical ballet as an important contribution to the cultural life of the city..."
"The house was almost silenced by the brilliance of Nikita Shcheglov who orbits the stage in a display of leaping galactic spirals"
"Monica Loughman and Alan Foley as the doomed lovers in Swan Lake, created a world of mystery and romance which captivated the imagination of the audience completely"
"Highly professional dancers, costumed to the peak of personal performance values, give their technical best"
"Alan Foley gave a dynamic performance showing both technical accuracy and confidence as well as a fine style of aerial impulsion"
(Kirov Ballerina) "Veronika Ivanova executed her part with typical Vaganova legs of steel and burnished fifths"
"Corkonians gave a well-deserved standing ovation to Cork City Ballet in the Opera House"
Cork City Ballet isn’t just a company. It’s a collaboration of dedicated, passionate people who come together to make sure that our commitment to the best in dance in Ireland is upheld, and available to all who seek it. 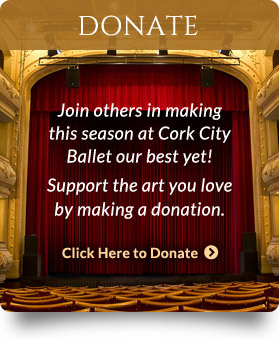 From our staff, artists and Board of Trustees to our many volunteers, the Cork City Ballet family works tirelessly to ensure that we stay true to our unique vision of live performance of main-scale classical ballets in Ireland. We hope our newly designed website will act as an introduction to the artistic and administrative staff of Cork City Ballet for you, and that you might learn more about the exciting workings of this vibrant ballet company in Cork, Ireland.